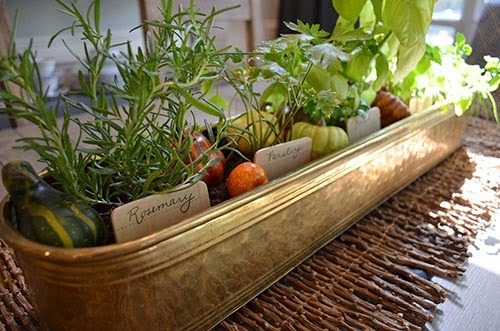 Ever since I bought this long, narrow brass planter from the thrift store, I really wanted to plant an indoor herb garden. My thumb is not exactly green, but I was hopeful that I'd be able to keep some herbs alive for at least a little while. After a quick trip to my local Calloway's nursery, I had five small herb plants for my planter. Using some leftover potting soil, I planted them in my planter. I want to have some cute labels for each herb, so I rummaged through my craft supplies for something that might work. I found these small balsa wood pieces that I bought a long time ago from Hobby Lobby that were like oversized popsicle sticks. My exacto knife helped me cut the thin wood pieces in half, and I used a regular pen to write out each herb name. It was one of the simplest and most instantly-gratifying projects I've done in a long time. I think the mini garden adds a nice touch of green to our formal living room– plus I love using it as part of our fall decor! Did I mention they smell great? Now I just have to work on my cooking skills so I can actually put these herbs to good use!